Indian Summer 1E | First Edition 1E Ponies Figurines | One Price Low Flat Shipping! From the Trail of Painted Ponies First Edition 1E Serial Numbered Collection, Indian Summer. Made of resin. Measures 6" tall. Brand new in original box. An agricultural people, the Hopi have sustained themselves for millennia in the Northern Arizona desert without the benefit of rivers or streams. The Hopi Way is to work hard, pray, sing, take part in ceremonies, and create images they believe will summon help from spirit beings. This Hopi artist has incorporated a variety of traditional Hopi symbols into his design, all of which revolve around rain and moisture, and a successful harvest. Butterfly maidens are believed to help pollinate crops. Nothing could grow without the sun. Dragonflies are signs of a natural spring. 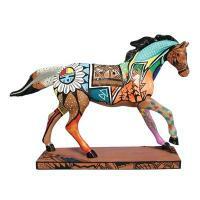 Buddy Tubinaghtewa is a nationally renowned kachina carver and painter who grew up on Hopi Mesa. His original "Grandfather's Journey" was crafted into a figurine.